iQRenew will help Australia deal with the problem of plastic by processing it locally. We will enhance our local ability to process recyclable plastics (such as PET/HDPE) into a flaked and pelleted feedstock, which can be used by domestic and global manufactures. Significantly, for the first time we will have the ability to process residual or End-of-Life Plastic, that was previously sent to landfill by utilising a unique chemical processing platform. 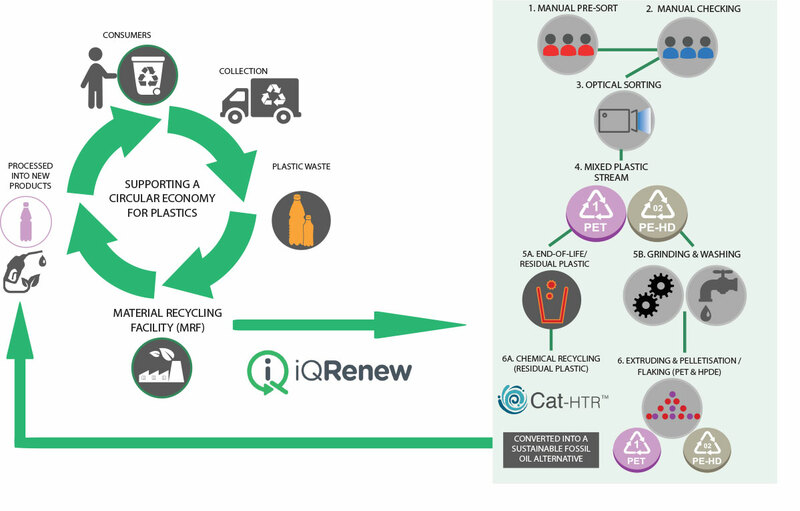 In July 2017 China notified the WTO of an import ban on waste plastic effective by end of 2017.
iQRenew owns the Cat-HTR™ platform for Plastic in Australia. This unique chemical recycling technology has a low environmental footprint, and produces a high quality sustainable oil from plastic otherwise sent to landfill. By using the Cat-HTR™ platform to process residual plastic, we deal with the problem locally, preventing stockpiling, shipping overseas, incineration and dumping in landfill. By utilising plastic as a feedstock, iQRenew is helping to divert plastics from landfill and our oceans, and in the process creating a more sustainable oil, reducing the need for virgin fossil oil. By producing drop-in fuels and chemicals from this feedstock, we are helping offset the need to produce these from virgin fossil crude oil. Plus we can produce valuable new products with a unique selling point for companies with resource efficiency targets. Our work with End-of-Life plastic is supported by an Australian government A$1M Accelerating Commercialisation grant. Licella’s large pilot plant has already successfully converted a high concentration of End-of-Life Plastic to oil, and Licella™ continue to work with iQRenew to refine this process. Traditionally the easiest types of plastic to recycle have been PET (Polyethylene terephthalate) and PE-HD or HDPE (High density Polyethylene). PET and HDPE plastics are very popular for manufacturing bottles and jars. PET sets into a clear plastic, is lightweight and tough against gases and liquids while HDPE has an opaque appearance and is highly resistant to diluted acids, oils and alcohols. Currently iQRenew operate one plant that washes, colour sorts and flakes HDPE and PET plastic for reuse by plastic manufacturers. 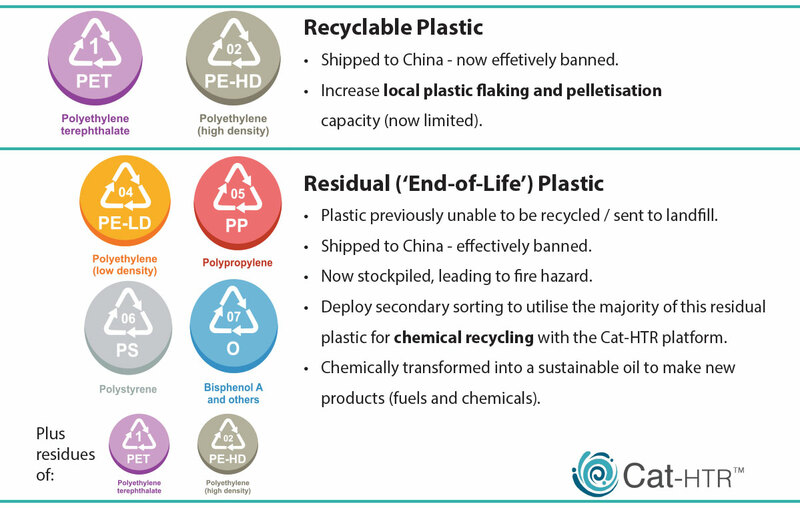 The remaining excess PET and HDPE plastic has up until now been bailed and sent to China – however this is now banned. Australia urgently needs a local solution to deal with the building supply of PET and HDPE, currently being stockpiled, to avoid all this plastic going top landfill. iQRenew has plans to upgrade its existing facilities for production of HDPE and PET plastic flake and plans to invest part of the revenue from the Government’s Container Deposit Scheme to achieve this. 1. World Economic Forum, Ellen MacArthur Foundation and McKinsey & Company, The New Plastics Economy — Rethinking the future of plastics (2016, http://www.ellenmacarthurfoundation.org/publications).